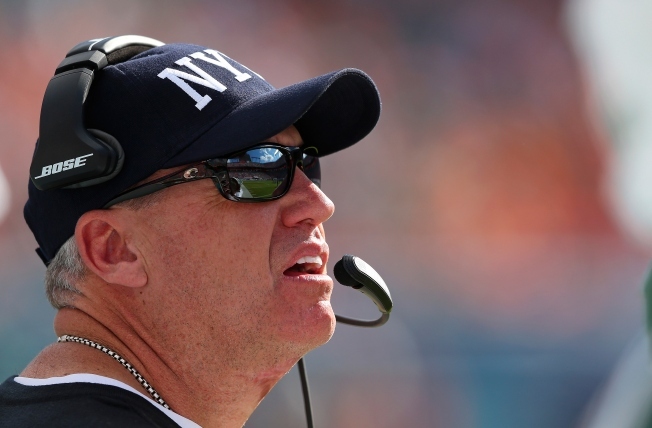 Head coach Rex Ryan of the New York Jets looks on in the second quarter as the Jets met the Miami Dolphins in a game at Sun Life Stadium on December 28, 2014 in Miami Gardens, Florida. The Chicago Bears are in the midst of trying to find a new head coach and general manager, and despite statements to the contrary by both George McCaskey and Ted Phillips, it would seem that they have already begun ruling out candidates. While there are certainly reasons that the Bears could be uninterested in acquiring Ryan (if he’s demanding a dual role as head coach and G.M., or has contract demands that are beyond what the Bears are willing to accept), it seems curious that they’re that dead-set against hiring him. Yes, the team has stayed away from hiring coaches with NFL head coaching experience in the past, and hiring someone with a bombastic personality like Ryan’s could be something the McCaskey family wants to stay away from, but wasn’t the whole point of hiring a new coach and G.M. that the team could set out in a fresh direction? The Bears suffered from a lack of leadership last season. The Bears suffered through two straight years of horrendous defenses. The Bears have a history of going after a guy with no head coaching experience, and it generally doesn’t work out. All of those things would seem to point in favor of going after a guy like Rex Ryan, but apparently the team doesn’t agree with that assessment. There’s no guarantee that Ryan would even want to come to the Bears, considering that jobs with the San Francisco 49’ers and Atlanta Falcons would likely pique his interest more, but eliminating him from contention without even interviewing him seems to be a silly move for a team in need of a culture change, and it’s hard to take the search seriously if they’re going to toss aside well qualified coaches like Ryan straight away.